I have duo of amazing patriotic polishes from Melissa at MDJ Creations, just in time for Independence Day! This is American Vintage! 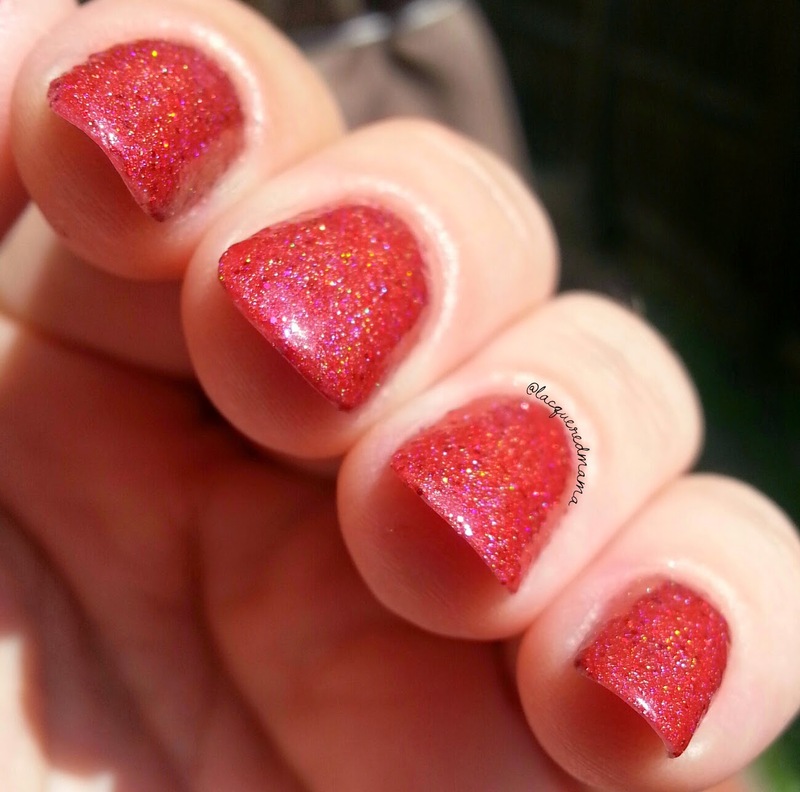 A beautiful antique red glitter holo...Beautiful! 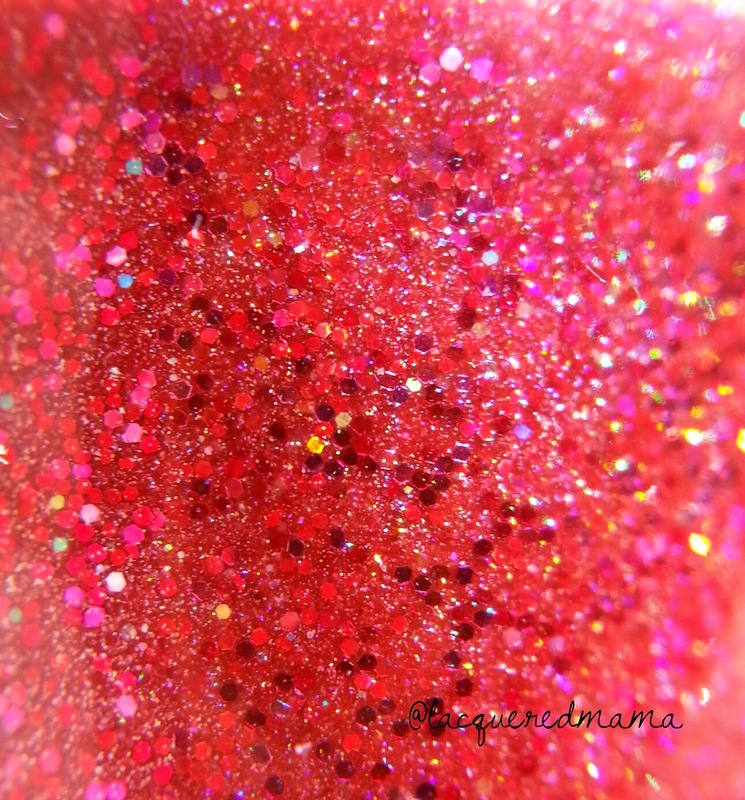 I love red polishes and this one takes the cake! 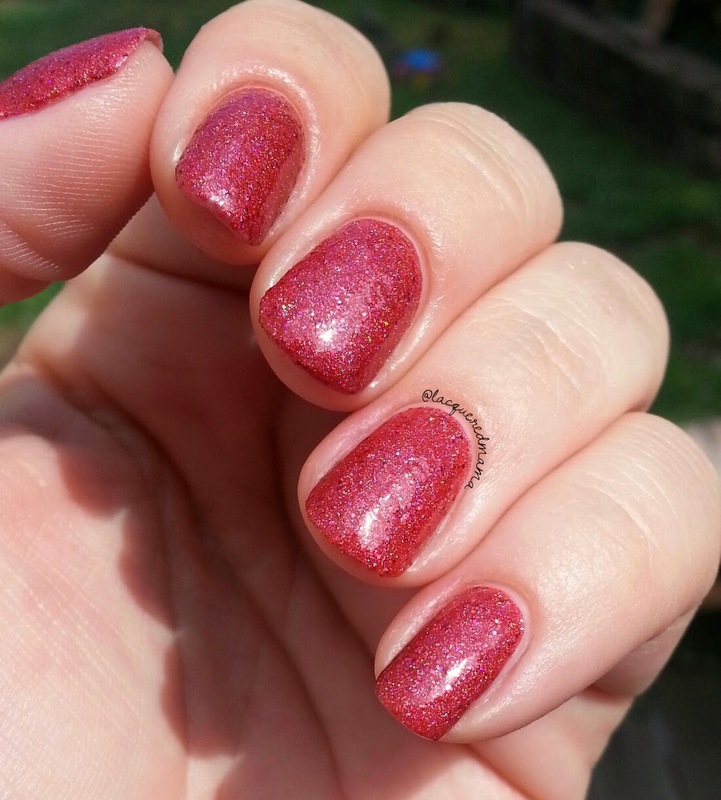 For those not completely into dark reds or even pinks; this one is perfect. It's sort of a rusty, burnt red..if that makes sense. 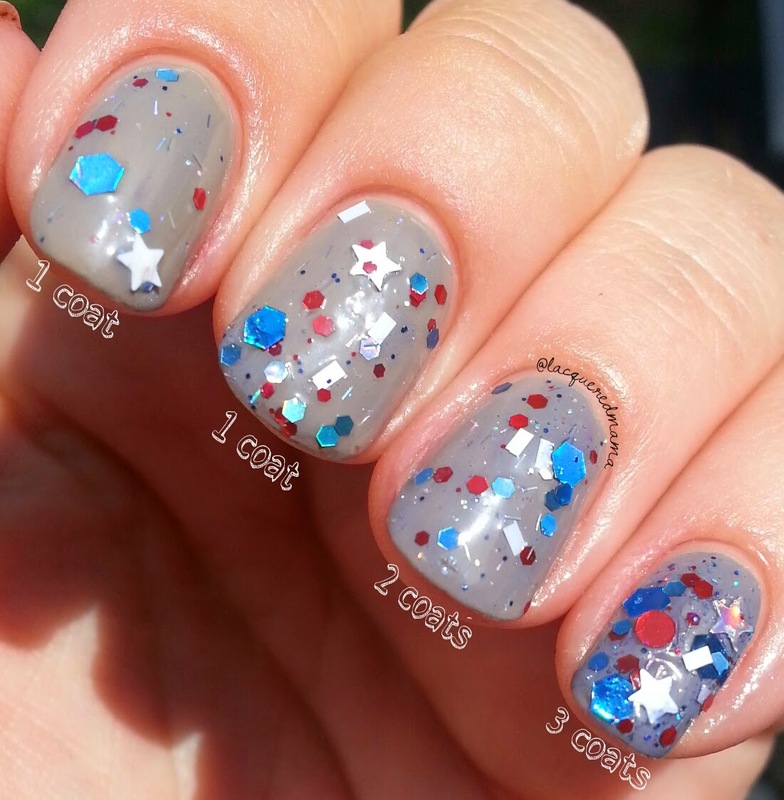 It has a wonderful formula and it opaque in just 2 coats. It does dry to a rougher finish, similar to sand, topcoat does the trick to smooth it out. 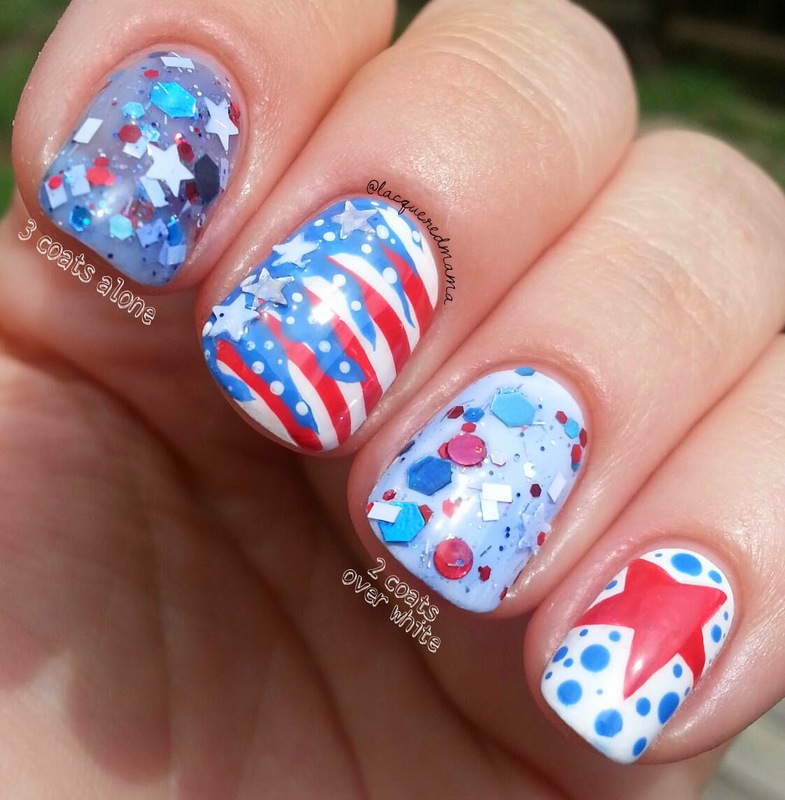 I only did 1 coat, but 2 coats would like give it a more glassy finish. Next in the duo is All Her Glory! 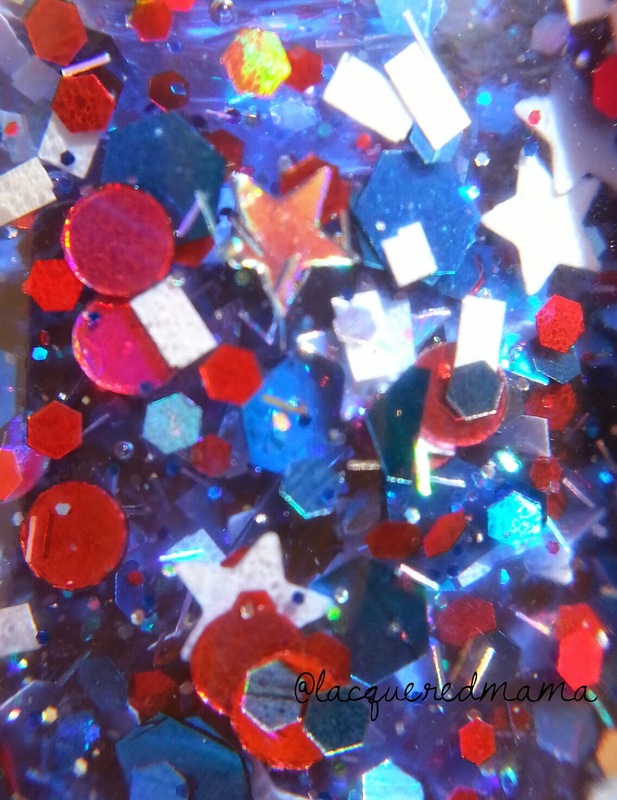 A glorious glitter topper. 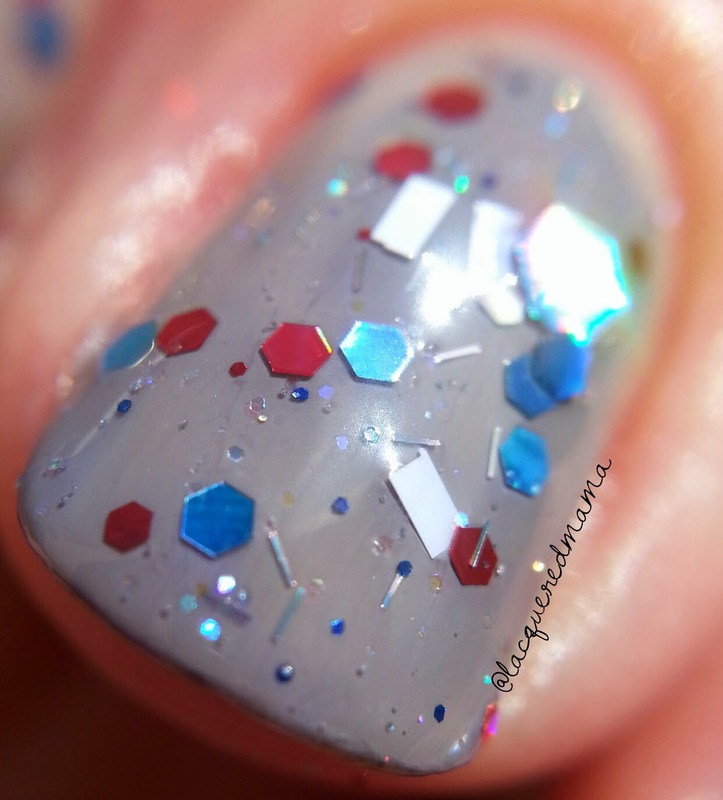 It is jam packed with white matte and holo stars, red circles and small red hexagons, blue hexagons, blue holo hexagons, small white rectangles, and micro glitters - all in a light blue tinted jelly base. I didn't pair it over top of American Vintage, as I didn't want them to compete with each other..haha! Gotta be fair! Plus I didn't want the red glitters to disappear. I first layered it over Nicole by OPI's My Jay or the Highway (which is a neutral grayish tan color). As you can see the blue becomes deeper with each layer. 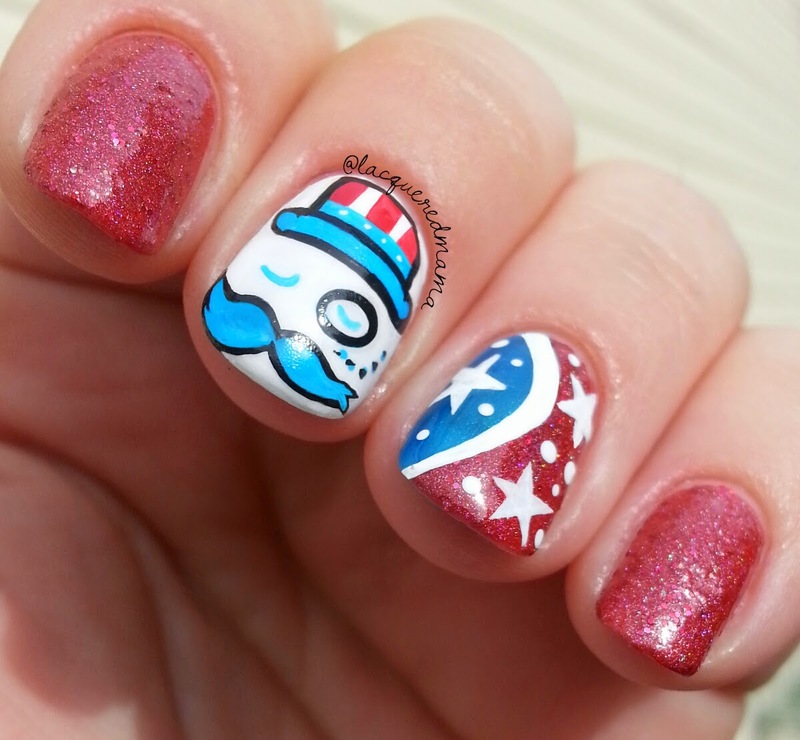 Now for my fancy shmancy nail art! 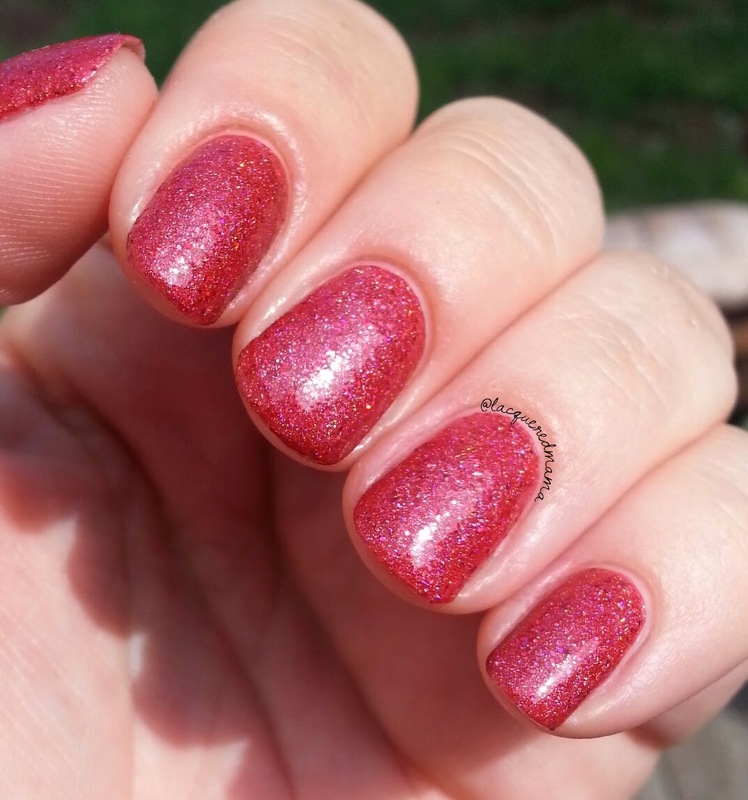 You do need to do a little glitter placement as the glitter tends to want to all end up closer to the tip of your nail, but that's pretty typical and not a con at all. Amazing duo! I loved them both equally and I believe you all will too! Melissa just added this to her shop last night, so be sure to check it out and get it while you can! 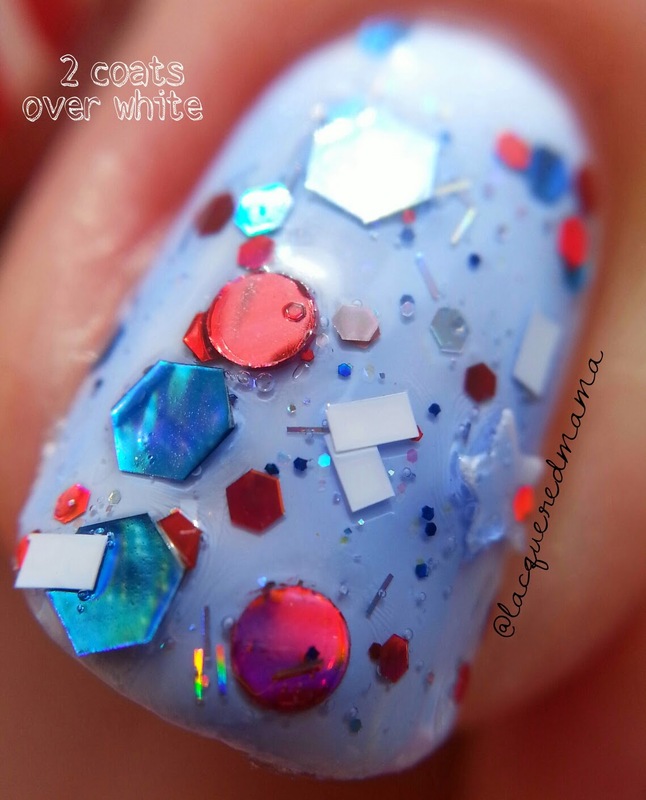 You can visit her shop here and don't forget to stalk her on Instagram and Facebook as well!